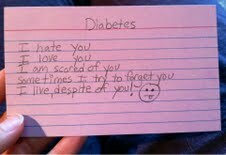 As requested, here is another one of the poems I wrote for Diabetes Art Day yesterday. Read this post to read another one of my poems and learn more about Diabetes Art Day and my experience with it. I ended up writing about five poems for the occasion so I will be sharing one with you almost every day this week! What are some feelings you have about your diabetes?